Editor’s Note: Well, it appears the whole Kavanough/Blasey show is almost over. Perhaps this distraction was enough to keep the public’s attention from something far more critical. Many feel both Kavanough and Blasey are deep state operatives, which does make the whole show pointless…or does it? President Trump has always had the ability to release the unredacted FISA memo, but choose to play a game perhaps to highlight and condemn the deep state even further in public eyes. Tonight at a West Virginia rally (see video below at 2:08:00), Trump was felt to be encouraging public action against liberals which could be an opening move to actively promoting a low level of public disturbance necessary for imposing martial law. Is martial law a bad thing? Not necessarily, as martial law may be in order as events snowball ultimately leading to bank closures while central banks across the globe are closed allowing the Quantum Financial System to be engaged, as well as the long-awaited massive arrests take place. Timing is everything, so we shall see how Earth’s massive changes evolve. It seems to me that while martial law is in effect, a reorganization of our government will occur. JFK, Jr. anyone? Of course governmental changes in the US will also occur globally evil power is not limited to the US. I also expect to see the Vatican exposed. Stay tuned! What about the unusual activity being seen around the Sun? It appears as if the Galaxy IS showing up for the show soon to happen on Earth as mankind (finally) makes moves to throw off the yoke of financial slavery prompted by the deep state under the direction of evil. 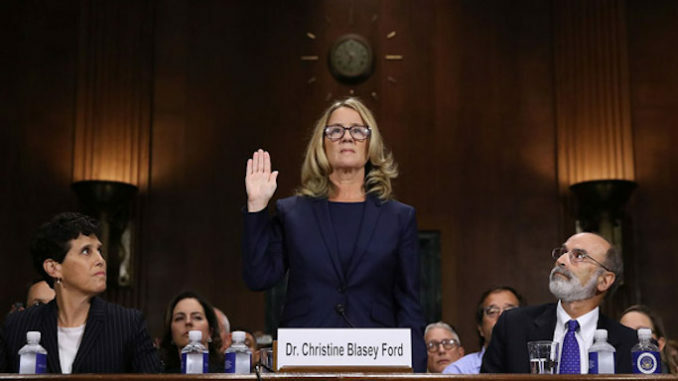 Testifying under oath before the Senate Judiciary Committee, Christine Blasey Ford identified herself as a “psychologist,” but records indicate this is a false statement. At the start of her sworn statement regarding the allegations of sexual assault against Supreme Court nominee Judge Brett Kavanaugh, Dr. Ford may be guilty of perjury under California law. Dangerous.com reports: The issue lies with the word “psychologist,” and Ford potentially misrepresenting herself and her credentials, an infraction that is taken very seriously in the psychology field as well as under California law. This entry was posted in Uncategorized and tagged bank closures, Christine Ford, deep state, galactic support, love, martial law, mass arrests, perjury, Quantum financial system, rally, solar activity, Trump, unredacted FISA memo, West Virginia. Bookmark the permalink.